I probably should’ve been quicker about locking my gains on this one because price started climbing even before the RBNZ made its decision! Even though the central bank decided to cut interest rates by 0.25% and indicate scope for further easing, the Kiwi broke past that descending channel I was looking at. In my short-term trade setup, I decided to hop in at market (73.25) when price was already testing the channel resistance and area of interest at the Fibs. The pair did show a bit of bearish action upon hitting the top of the channel, even dipping below the 73.00 major psychological level. But just when I thought the selloff could carry on, the pair made its way back above the resistance and started to climb as risk-taking was in play before the RBNZ statement. In a similar fashion to the Aussie’s reaction to the RBA statement, the Kiwi also popped higher when the decision came in line with expectations. Because of that, I decided to exit my trade when I saw that price made a convincing break above the top of the channel and Fib levels. 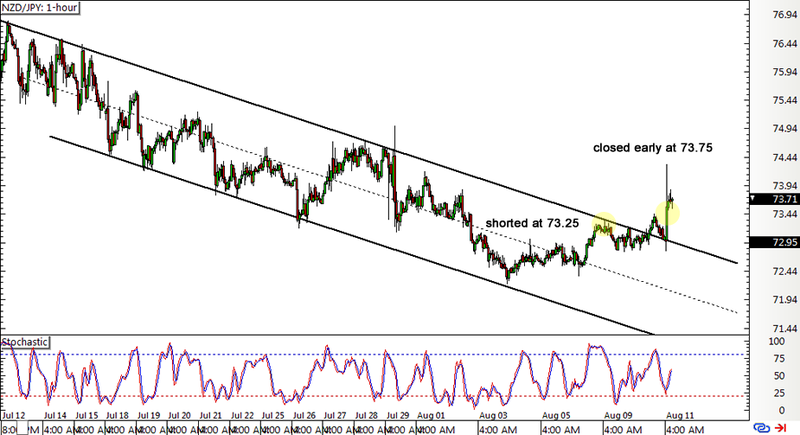 This allowed me to trim my losses before the pair could make it to my stop past 75.00. Thank goodness I only risked 0.25% of my account on this position, too!